The Tech Wear VOJ-23-4X eliminates the collar on Tech Wear 's streamlined V-Neck jacket design that adds comfort and lessens bulk at the neckline. 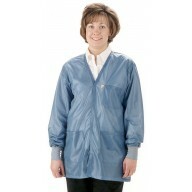 Set-in sleeves, roomy patch pockets and snap adjustable sleeve ends are built-in features. The front closing snaps are color-matched and powered-coated for attractive "no-scratch" performance. 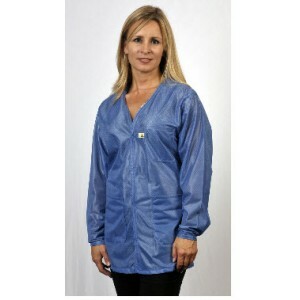 Tech Wear VOJ-23-4X Features: Fabric Weight: 2.3 oz. 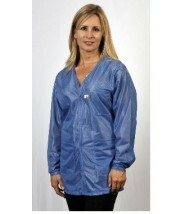 per square yard Content: 87% Polyester, 13% Carbon Thread Surface Resistivity: 105 ohms/sq. 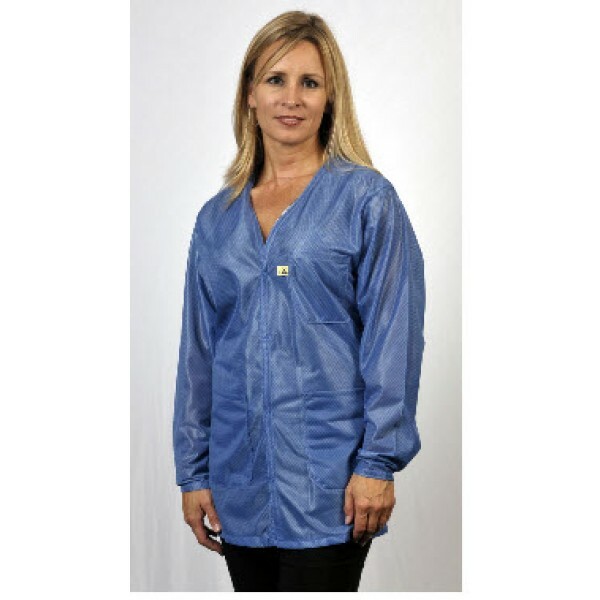 Static Decay: 5000V to 500V in less than 0.1 second Size- 4X NOTE: This garment is made of ESD-Safe materials. The static dissipative properties do not come from any kind of spray-on application. Custom embroidery or patch available - please call or email our Customer Service department for details. 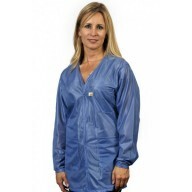 Tech Wear Traditional ESD-Safe 32"L V-Neck Jacket With ESD Cuff OFX-100 Color: Hi-Tech Blue Size: 3X-Large. Tech Wear Traditional ESD-Safe 32"L V-Neck Jacket OFX-100 Color:Hi-Tech Blue Size: Medium.